Ventless hoods systems are brilliant they remove smoke and grease, while releasing clean, filtered air back into the kitchen. Wells Certified Ventless Hood Systems can even purify air to better than EPA standards. Did we mention there is no exhaust? Then you have UL Certified ventless hoods that provide fire protection systems. Ventless hoods are not designed to replace traditional Type-1 hoods, but provide a viable solution where with traditional hoods it would not be possible, or meet local codes. For example historic buildings where altering the building to install ductwork or to putting fans on the roof isn’t allowed. Type-I hoods in high-rise buildings can be expensive when you consider the cost of installing ductwork dozens of stories to the top of the building. Some buildings are too large for the ductwork you find in traditional hoods, like, stadiums, arenas and supermarkets. While other locations aren’t suitable, for example food courts, malls and airports. Ventless cooking systems can be an awesome solution for existing restaurants with no room under an existing hood to accommodate additional equipment needed for menu expansion. Giving you the flexibility to easily set up a wide range of electric equipment such as ovens, deep fat fryers, ranges, griddles, hot plates, rethermalizers, woks, steamers, combi ovens and induction. Ventless hoods are also depreciate quickly providing tax and cash flow benefits for restaurant owners and since they’re portable, it can be perfect for leased spaces. 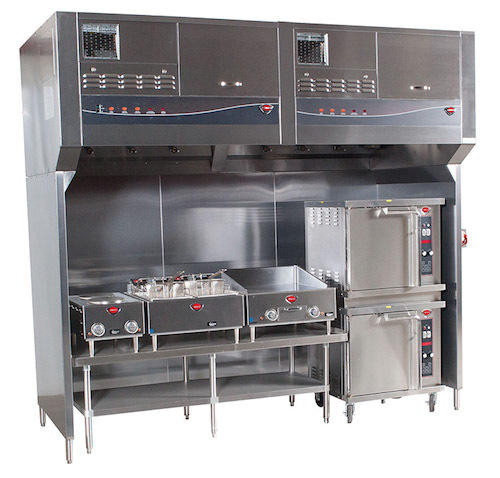 Wells Manufacturing offers a wide range of Ventless Hoods and Cooking Systems. They are available in many sizes and shapes, from counter top models to large systems that work with entire cook lines. Accommodating a wide variety of types and brands of electric cooking equipment, Wells is a great source for Ventless Cooking systems.